Works well in a Paladin Mech. Decent Synergy with Cobalt Guardian. This is a minion that, most of the time, is considered weak or even useless. And yet, whenever an enemy drops one, you will WANT to kill it ASAP, because the mental process goes "The enemy must have something big they want this to put on the board". In a way, it might even serve to lure out removal so later minions are at less risk when played normally. 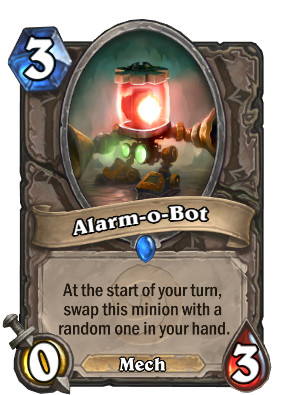 this card can be realy OP, just got a turn 2 ironbark (innervate +alarm-o-bot) then turn 3 illadan (coin + alarm-o-bot) then turn 4 ragnaros. needless to say it was a short game. moral of the story...ALWAYS KILL ALARM-O-BOT! Knowing Priest, you probably had ten cards already in you hand. Beware ! Battlecry effect will not trigger for the card swapped in. which is useful when trying to summong cards like Deathwing.